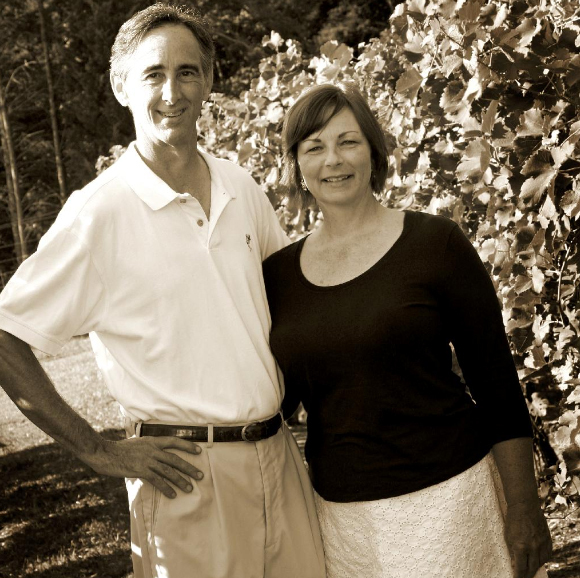 Hunting Creek Vineyards started in April 2002 with the planting of 100 Merlot, 100 Petit Verdot and 100 Viognier vines. We opened our tasting room in November of 2009 after much encouragement from our friends. The phrase, “From the ground to the glass” encompasses our thoughts and practice on making this adventure satisfying and rewarding. We take great pride in producing smooth wines at an affordable price. Milt has a background in chemistry and medicine, and Sandy is a critical care nurse. Our experiences in these fields have prepared us well for taking care of a vineyard, winery and our customers. We are a blended family and blessed with four amazing, accomplished children who have participated in our ‘dream’ in many ways. Our youngest son, Jeremy Ligon is a winemaker in Northern Virginia. With his exceptional palate, he helps us evaluate our wines and craft our Indulgence blend. We now have 5 acres of vineyards where we grow Merlot, Petit Verdot, Malbec, and Viognier. We have partnered with Front Porch Vineyards and Pinehaven Vineyards to purchase locally grown quality grapes to expand our wine selections. We remain a small winery and do all steps of the growing and wine making ourselves with the help of four part time employees. Shawn has been with us for 7 years working in both the vineyard and the winery, and for 8 years off and on Angela has worked across all areas of the business and still joins us for events. Pam works in the tasting room on Saturdays, and Josie, the newest member of our team, is updating our social media presence and helping create new events We feel very fortunate to have such a dedicated team. We believe in supporting local growers and our community. Our philosophy is that a healthy balanced vine creates the best possibility to make exceptional wine! Our customers return year after year and often become friends. We are passionate about our wine and love to share it with others.